We perform Non-Religious Wedding Ceremonies. 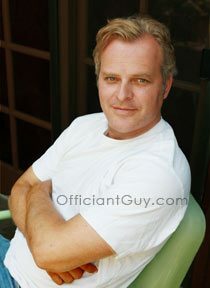 Officiant Guy gets the most requests for non religious wedding ceremony vows all over Southern California. We understand and we respect your wishes. We are nondenominational wedding officiants. Chris honors what you want said during your wedding ceremony format. Many times we have heard of a wedding minister who either goes into automatic mode and uses religious language or phrases during the wedding service or even worse, an officiant with an agenda who recites the Lord’s Prayer; or a wedding officiant who inserts religious wording during the wedding vow to the horror of the bride and groom. We’re not like that nor will we ever be. We will always speak the words that you request. What kind of Non Religious Wedding Vows are there? We have several non religious wedding ceremonies handy for you or if you would like to create your own or borrow someone else’s nonreligious wedding ceremony ideas, that’s fine with us. There are all kinds of wedding ceremony vows and therefore, you should pick one that fits your relationship. We will officiate the non religious wedding ceremony the way you want it. It’s your wedding day, after all. It should be the way that fits you and your mate’s beliefs and lifestyle. 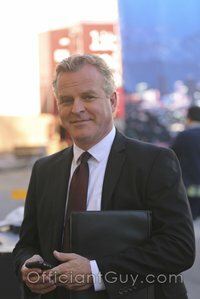 Chris is the most popular wedding minister in LA. Chris Robinson is an LA officiant for nonreligious weddings. He has been officiating wedding ceremonies and issuing wedding licenses for over 20 years. If you wish to get married somewhere in Los Angeles County then give the top non-religious officiant for weddings in California a ring at (310) 882-5039 or (562) 547-3255 or you can fill out the contact form.